The 1950s were a fun time to be a kid! Everyone liked Ike, watched movies in 3D, danced in their socks to Elvis, and sipped on one malt with two straws at the local soda shop. Side note: Is that even sanitary?! Were they too cheap to buy two malts? You were either a cube, a cool cat, or a sweater girl and you most definitely wanted to catch your friends on the flip side. Wow! Times sure have changed. There's nothing to flip over anymore. The music just plays and plays - no juke box necessary. Shoes are still optional, however. These may not be blue suede shoes, but they sure will rock your poodle skirt. 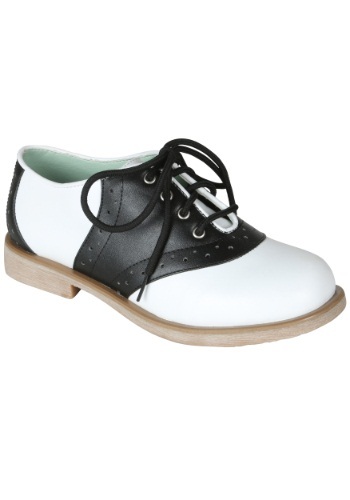 Whether you are wearing a 50s style costume or just like to look fab around the clock, these black and white saddle shoes are cherry! They come with white laces and a sturdy brown sole, daddy-o! I have not received them yet but am very excited to get them! My daughter will look great on halloween in her 50's poodle skirt & saddle shoes! Can't wait!